(Nanowerk News) A solution-phase process has been developed by CNM users from the University of California at Riverside, working collaboratively with the Nanophotonics Group, for synthesizing stable multifunctional colloidal particles composed of a superparamagnetic Fe3O4 core, a gold nanoshell, and a mesoporous silica outer layer ("Tailored Synthesis of Superparamagnetic Gold Nanoshells with Tunable Optical Properties"). 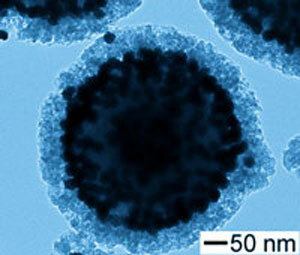 TEM image showing the evolution of Au nanoshells after 12 cycles of seeded growth. The unique porous silica layer is produced by a surface-protected etching process. By tuning the pore structure of the silica networks through etching, the shape and size of the gold nanoparticles can be controlled during the seeded growth, as well as their interparticle plasmon coupling. Controllable interparticle coupling enables “hot spots” for surface enhanced Raman scattering. The inclusion of responsive superparamagnetic Fe3O4 cores broadens the applications to include magnetically guided delivery and magnetic resonance imaging. The evolution from gold seeds to complete shells, and the corresponding change in plasmon bands, can be precisely controlled by the number of growth cycles and silica shell porosity.